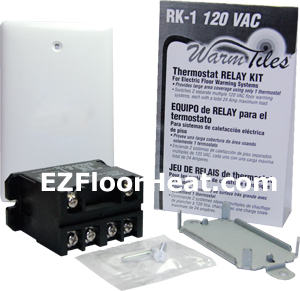 Use this 120V Thermostat Relay Kit in conjunction with the ET-1 or GTS-1 Thermostat Kit to provide a total of 24 Amps maximum load per floor warming system. Unlike the standard 16 Amp load available on the ET-1 and GTS-1 Thermostat Kits, the addition of a 120V Thermostat Relay boosts the maximum load to 24 Amps. Using the Standard spacing method, this means the 154 square foot maximum (DFT1069 + DFT1079 = Maximum 16 Amp Load) can now be increased to 226 square foot maximum(DFT1108 + DFT1108 = Maximum 21.4 Amp Load). The Relay is housed in a separate electrical box typically located just below the Thermostat electrical box, and requires a second line voltage feed to operate. Make sure to follow the installation instructions provided with each Kit.